Computer-controlled molding is the secret to the tournament winning Speed Trap. The process creates a very thin-walled, high-action body, which produces maximum vibration while offering incredible balance. 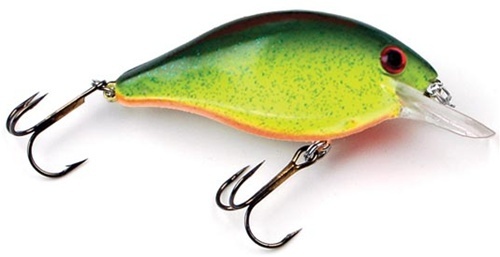 This crankbait will not roll over at any speed. Work it slow or burn it over shallow cover, presenting the bait to the maximum number of fish. Pros have referred to the Speed Trap as the "Limit Getter" for its ability to cover water quickly and effectively. A pros quote in Bassmaster magazine explained, "It's a great search bait. I always have one tied on when I go to a lake I've never been before. It's a confidence thing. I can cover water fast and learn which areas hold bass." Dive depths for the 1/8 ounce model is 5 ft. respectively.